Although the number of new outbreaks continues at a much reduced rate over last month, the French MOA continues to identify sporadic new HPAI outbreaks across the nation's southwest. 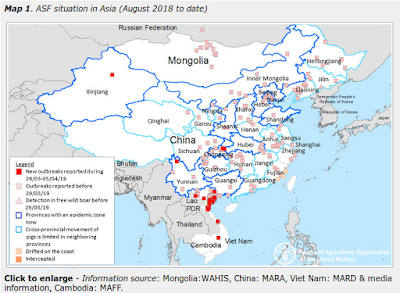 While the impacts have been relatively small, they involve five new strains of avian flu, all said to be of `European lineage', and not descended from the more dangerous Asian H5N1 virus. Details on these viruses (HPAI H5N1, H5N2, H5N9 and LPAI H5N2, H5N3), and how they all emerged more or less simultaneously in France, have been slow to emerge. The last DEFRA Update On France's HPAI Outbreak (Dec 24th) cited this lack of information as hampering their ability to produce a full threats analysis. The most recent outbreak comes from the Pyrénées Atlantiques, and is the first reported there since December 20th. Here is the latest (translated) update from the French MOA. In total, to date, 67 of highly pathogenic avian influenza outbreaks in poultry were detected in 7 southwestern departments of France. 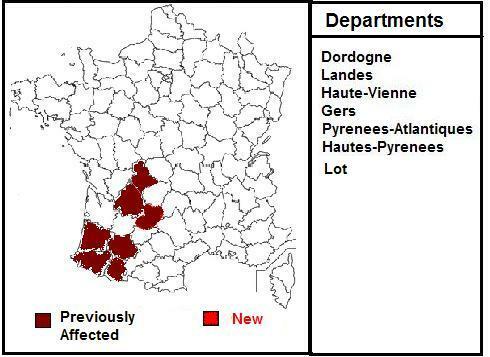 ANSES gave its opinion delivered on 14 December 2015, on the potential danger to humans from the avian influenza strain identified, including the results of the complete sequencing of the H5N1 strain detected in the first home in the Dordogne. She confirmed the absence for this dangerous H5N1 strain of the key markers for human.